In a 2015 audience with children of the Peace Factory, Pope Francis stated: “We are all equal — all of us — but this truth is not recognized, this equality is not recognized…When we do not see this, society is unjust. It does not follow the rule of justice, and where there is no justice, there cannot be peace.” These words echo the words of Pope Paul VI who, in his 1972 World Day of Peace Message, spoke of peace as rooted in justice — a sincere feeling for our fellow human beings and for the earth, especially the marginalized and oppressed. In the 2018-2019 lectures, our speakers invite us to explore the search for peace and justice as it is present in so many aspects of our world: along the path of reconciliation; among women in the church; and in the ongoing work to overcome the injustice of the death penalty. They will consider how The Saint John’s Bible illuminates justice, the intersection of social transformation, culture, and architecture, and the challenges faced by young people who are seeking meaning and peace outside the doors of our churches. We hope that you will join us as we welcome David Wells (October 19, 2018), Heidi Kiiwetinepinesiik Stark (November 16, 2018), Christine Gervais (December 7, 2018), Jonathan Homrighausen (February 1, 2019), Sr. Helen Prejean (March 1, 2019), and Janna Levitt (April 5, 2019) to this year's series. All lectures at St. Jerome’s University are provided on a complimentary basis. Please note that although our ticketing system will issue you a ticket for your participation, you DO NOT HAVE TO SHOW YOUR TICKET in order to attend the lectures. Your registration using the online ticket registration system helps our event support staff to arrange for reception food service and to anticipate seating requirements. We greatly appreciate your registration in advance of each lecture. 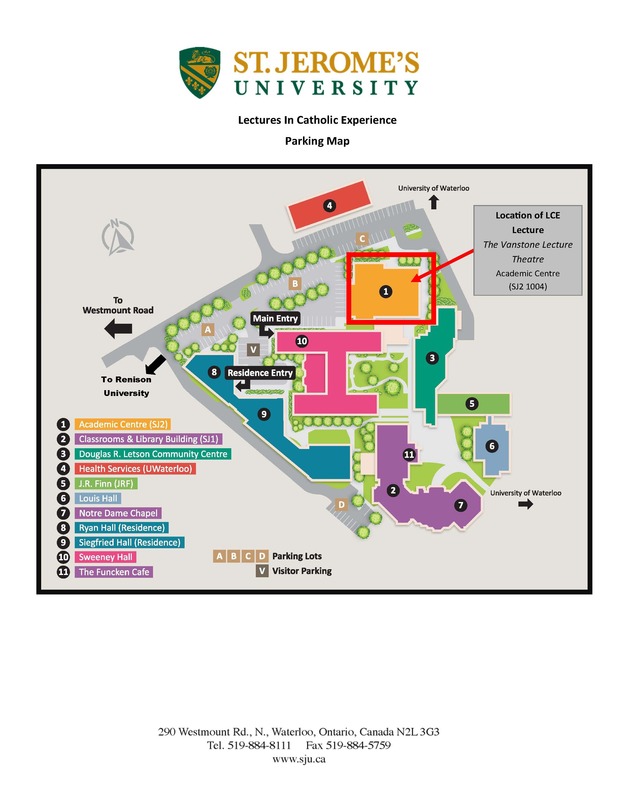 Complimentary parking is available in Lots A and B at St. Jerome’s University. Pay for use parking options are also available within walking distance of the Academic Centre. The Lectures in Catholic Experience take place in the Vanstone Lecture Hall, Academic Centre (SJ2), located at St. Jerome's University. Click here for detailed location and map information.